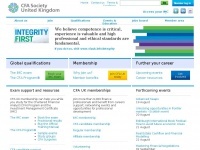 CFA Society of the UK (CFA UK) is a member society of the CFA Institute, a global association of investment professionals. Learn about our qualifications and membership. Cfauk.org presents an article about a specific topic. In total 4 links were found which refer to Cfauk.org. Individual words like Society, Kingdom and United are frequently used in text links from other websites. The most important link sources for this website are Cfainstitute.org and Messagelab.co.uk. The homepage of Cfauk.org and the subsite are most referenced by other websites. The table shows the most important links to Cfauk.org. The table is sorted in descending order by importance. The table shows websites of Cfauk.org, which are often linked by other websites and therefore they are classified as important content. two profiles were found for Cfauk.org in social networks. Among other social networks the website is represented in Twitter and LinkedIn. The web server used by Cfauk.org is located in Great Britain and run by UK Government Department for Work and Pensions. The website Cfauk.org has a own web server. The web server only runs this website.